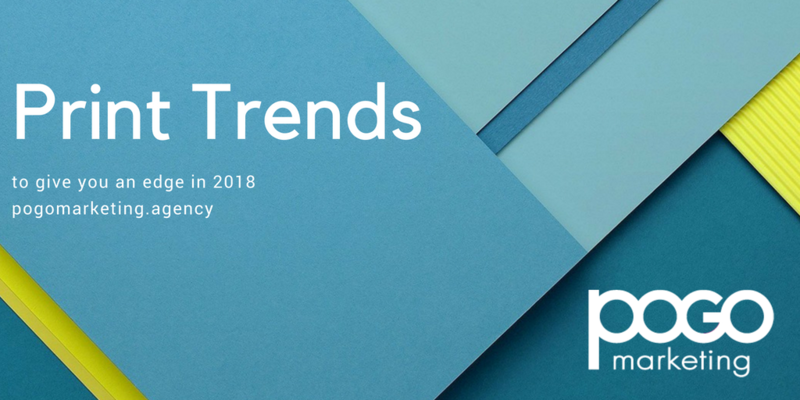 So far in 2018, there are a few trends for your print materials that will make you stand out from the rest of the bunch. You only have one chance to make a great impression with your print materials, and it could mean the difference of someone calling you vs. them throwing your print materials in the trash. Let’s talk trends and see if any of them can help you! 1. Print and Digital go hand in hand. If you have an online presence, you want your print and digital marketing to consistantly represent your brand. In fact, the print industry may owe it’s resurgence to the digital marketing world. If someone is running a digital marketing campaign, a great way to build brand recognition is to have print materials that match it. Your print materials are also a great way to get your social media profiles out to your customers. Social media links are seen on business cards and print materials along side other contact information. 2. Be bold. In today’s world, if you don’t grab someone’s attention quickly you might loose them. One way to do this is to keep your designs simple but bold with bright colors and simple textures. If you notice this trend also is seen in websites. Easy to navigate websites with minimalistic design are what’s one trend online as well. By providing just the amount of information you need to with a simple print design you have a better chance at being successful. We don’t see this design trend going away anytime soon! 3. Create offers unique to your print materials. Offering coupon codes on your print marketing allows you to track the effectiveness of your print campaign while offering something special to your customers. The codes should be unique to for the person holding the print materials so that your customers can feel value on an individual level. These types of coupon codes tend to generate higher ROI than generic coupons available to everyone. 4. Try spot varnishing for dramatic effect. You can add emphasis to a specific part of your design with a technique called spot vanishing. It can highlight an area you want to draw attention to. You can make it shine or you can even use the opposite effect by having the spot you want to draw attention to be the matte part of the print materials. This is a great way to be creative. Want more ideas? Call or email Greg Wilson at POGO Marketing to start your print project today. If you’re looking for a digital marketing campaign and a print marketing campaign to match, we can do that too! We are a one stop shop for all your marketing needs. Call today to get started.